We know that results from a machine data collection case study are imperative before making such an investment. We are pleased to announce a new one from Manufacturing News. Our customers at R&D Manco have been featured on all regional issues of the publication. The article focuses on results from using Predator MDC from Shop Floor Automations. Kevin Beach, the General Manager, is responsible for machine productivity and tasked with optimizing utilization. He decided to look for ways to implement an OEE solution with his existing equipment. The buzz about IIoT and OEE was definitely an attractive direction for him to proceed with. R & D Manco of Phoenix Arizona began in 1964 with owner Virgil Manion. It was then purchased by Chuck and Patricia Wyckoff in 1972. They started a sister company, R & D Specialty, in 1984. After a series of events where the main company was sold, ownership shifting back and forth, the two shops merged. Chuck and Patricia named the combined shops R & D Specialty/Manco in the 1980’s. The company name would be shortened to R & D Manco in 2016. In late 2017, the shop began a pilot program of Predator Machine Data Collection (MDC) on three machines. 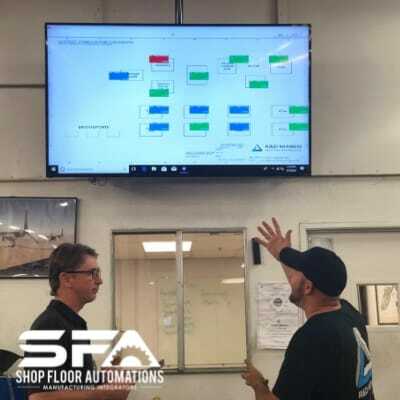 SFA, a Predator Software reseller and manufacturing integrator, implemented the machine monitoring system and was able to shed light on their current utilization rates. Check out the rest of the piece, and call R & D Manco at (602) 278-7700. 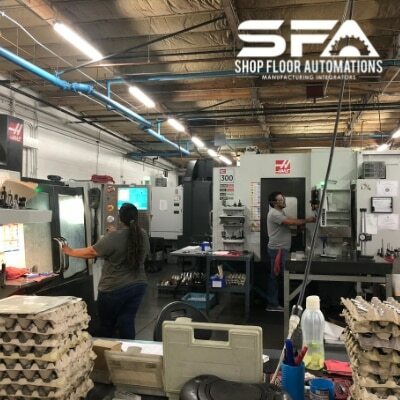 If you need improved shop floor productivity, call SFA at (877) 611-5825. We also can answer inquiries by filling out a contact form. When we visited an organization changing lives in nearby Santee CA, we were very affected by what we saw. This is why we wrote about Rise Up for Modern Machine Shop. We were happy to see they have featured the organization on their blog. Visitors from the industry are often inspired by what they see and hear at Rise Up, Mr. Greeves says. 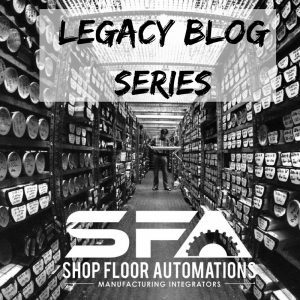 A good example he cites is a recent visit by Greg Mercurio, president of Shop Floor Automations, a manufacturing integrator based in La Mesa, California. Mr. Mercurio heard about Rise Up while planning activities to mark his company’s 20th anniversary. “I was looking for a special way to mark this milestone by giving something back to the industry and the community,” he says. Mr. Mercurio spent two hours touring the facility and talking to managers as well as trainees currently in the program. “The experience changed my perception,” Mr. Mercurio recalls. “I thought we could help by simply donating one of the solutions that Shop Floor Automations offers to the machining industry. As it turned out, the Rise Up machine shop wasn’t far enough along in its development to be ready for any of these solutions.” Mr. Mercurio offered a cash donation instead. CAD CAM software is a powerful shop floor tool. There is a long-term problem most users don’t consider. What happens to the programs that the software produces? “CAD CAM makes these beautiful models, then it produces G-code. 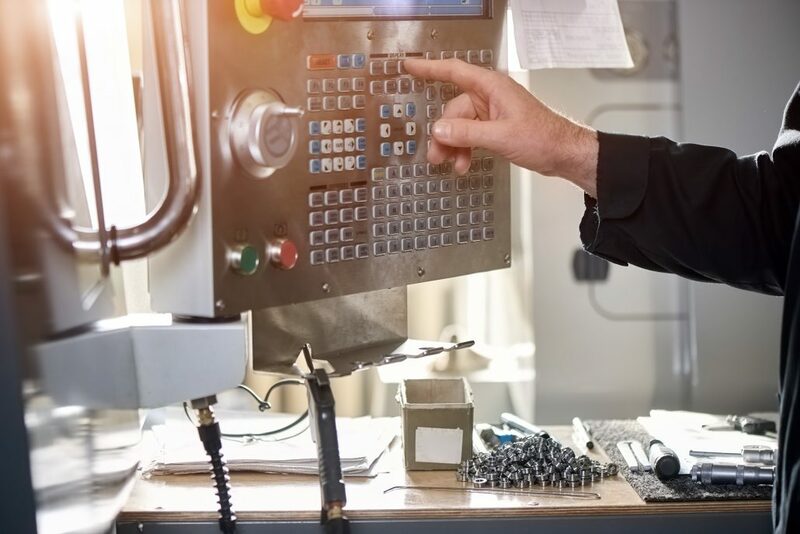 What’s going to happen to it?” This question was posed by a Shop Floor Automations (SFA) spokesperson on the Manufacturing Engineering podcast. Want RS232 to USB hardware results before purchasing? Check out this case study with Fredon Corporation! Today’s Medical Developments published this study in Winter 2018. 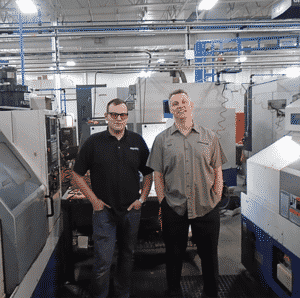 USB Connect hardware bridged a technological skills gap for this Ohio manufacturing company. A constant goal at Fredon is to remain at the front of the manufacturing world. 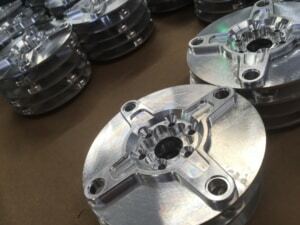 They seek to provide customers with high-quality parts, to manufacture with innovation, and keep close relationships with customers. Randy Glover Jr. at Fredon says operators are “skilled enough to surpass the expectations of a facility many times larger [than ours].” But there was a big productivity problem to address. 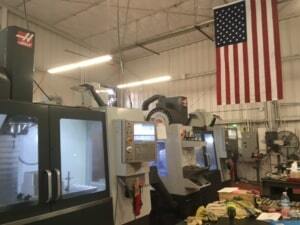 SFA highlighted two of our customers and one organization we work with for a MFG Day piece. We thank MoldMaking Technology (MMT) for sharing it. 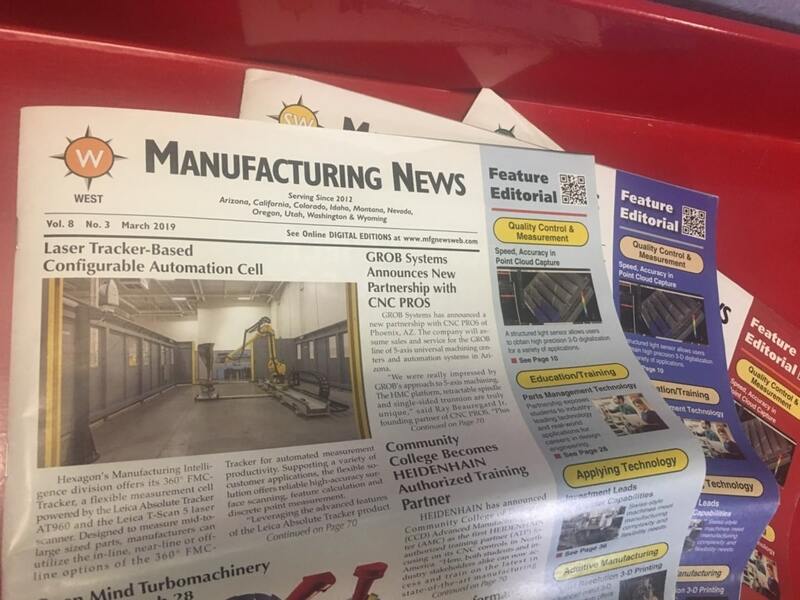 Thanks to MFG Talk Radio for publishing our piece about automation ROI. We had much more coverage recently and we thank Moldmaking Technology and Manufacturing Tomorrow for these articles. 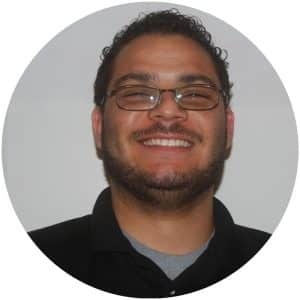 Sam Wilkins, Technical Operations Manager at Shop Floor Automations, has earned a spot in the SME 30 Under 30 List. We are very proud that Sam made the Honorable Mentions list from this distinctive Society of Manufacturing Engineers lineup for 2018. 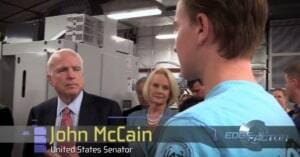 Sam’s love of technology began at age 16, when he took up computer systems as a hobby. He first entered the world of manufacturing by machining medical devices in a small shop. He then moved on to facilitating production of several medical product lines while implementing quality control systems. He was responsible for research and development from initial design to final products. He then moved on to the field of manufacturing integration, where he works with SFA today. Here, he uses his past experiences in manufacturing and his technical skills to find better productivity solutions for manufacturers. 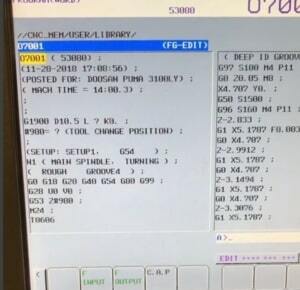 He is very familiar with protocols such as MTConnect, Fanuc Focas, and more. Thanks for all of your hard work, Sam! Other honors bestowed to employees of Shop Floor Automations: Marketing Coordinator Amanda Rosenblatt won the first ever SME manufacturing talent contest in 2017. We are also consistently the #1 Reseller of Predator Software and Scytec DataXchange each year. Ask us for our insight on integrating manufacturing solutions for your shop floor! Call (877) 611-5825 or fill out a contact form today.